1Department of Food Technology and Nutrition, Lovely Professional University, Phagwara, Punjab, India. 2Department of Horticulture, Lovely Professional University, Phagwara, Punjab, India. Fermentation is used since time immemorial for preservation of food. Since its inception, human kind has been practicing fermentation of various food products based on milk, fruits and vegetables, meat products, cereal and legumes, etc. Milk based products constitute of a large portion of our diet primarily in the Asian countries specifically in the Indian subcontinent. India produces about 132 MT of milk every year. Almost 60% of this is converted in traditional products. Fermented dairy products like Dahi(curd), MishtiDoi(sweetened curd), Shrikhand, Lassi and Chhach or Mohi (buttermilk), etc. are consumed frequently by the India population. For long the production of these products was unorganised. Recent technological innovations, research and awareness amongst masses has caused improvement in this scenario. The current paper reviews these products in term of present research advancement in mechanization and standardization of these products to be produced on a large scale, improving its economic value and nutritional significance. Keywords: Fermentation, Milk, Traditional products, Mechanization, Standardization. Fermentation is an economical and affordable technology which protects the food, enhances its nutritional value and helps in upgrading its sensory properties. It also assists the detoxification and elimination of objectionable factors present in unprocessed foods such as phytates, tannins and polyphenols (Gadagaet al., 1999). Fermented milk products were initially developed by nomadic Asian cattle breeders. These products are manufactured by following the fermentation of milk by particular group of microorganisms, resulting in a decrease in pH and in successive coagulation of milk proteins along with the microorganism which remains active as long as they do not experience heat treatment (Kabak and Dobson, 2011). Most of the fermented dairy products contain lactic acid bacteria (naturally present in milk), other bacteria as yeast and moulds are also included as well. In the procedure of making, starter cultures for fermented dairy products have been flourished (Wouterset al., 2002). These products are the vital components of human diet in many parts of the world in the form of curd, buttermilk, yogurt (Yoghurt), leben, cheese and acidophilus milk (Nair and Prajapati, 2003). Fermented milk products are known for their great nutritional and health related properties including prevention of gastrointestinal infections, reduction of serum cholesterol levels and antimutagenic activity. These are also beneficial for ingestion by lactose intolerant human beings and the patients experiencing atherosclerosis (Shiby and Mishra, 2013). It can diminish the symptoms of atopy (Cross et al., 2001). In India,fermented products such as Dahi(curd), MishtiDoi(sweetened curd), Shrikhand, Lassi and Chhach or Mohi (buttermilk), Chhurpi, Somar, Philu and Shyow are the known ethenic fermented products (Dewan and Tamang, 2007). This paper provides an insight into production, development and technological advances in manufacturing of the traditional fermented products of India. Dahiis the local name of the curd (Dewan and Tamang, 2007). It is considered as traditional fermented milk product and also a functional food as it is nutritionally and therapeutically beneficial for human beings (Yadavet al., 2007). It is consumed as such and also used as an intermediate product for many other products based on milk, such as buttermilk (Chhach) which is largely used as thirst quencher in summer? In eastern part of IndiaDahi is used as MishtiDoi/Dahiby adding sweetener such as jaggery, caramelized flavor and color to the Dahi. Dahiis prepared traditionally in almost every kitchen in India (Harun-Ur-Rashid et al., 2006). Dahi have live cultures that nurture therapeutic and health promoting properties along with nutritional benefits. The lactose in the milk is converted to lactic acid by the action of starter cultures and the lactic acid act as preservative for the milk and the low pH (4.5- 5.0) also inhibit the growth of harmful micro-organism, thus increasing the shelf life of the product (Sodiniet al., 2002). The therapeutic value ofDahiis due to the fact that the concentration of lactic acid bacteria in the intestine obtained by the ingestion helps in digestion of food (Naharet al., 2007). Also, during fermentation the milk protein can be partially degraded by the action of bacterial proteases into peptides, possessing various health benefits. The availability of calcium is also increased from milk and thus increases the nutritional value of Dahi. In this process proteins are broken down into biopeptides, possessing various health benefits (Neilsenet al., 2009). Dahi is manufactured using single or mixed cultures of Lactococcuslactis, Lactococcuscremoris, Lactococcusdiacetylactis, along with Leuconostoc species, a combination of acid and flavor producing bacteria. These bacteria are responsible for imparting firm body, sweetness and a mild acidic flavor to theDahiincreasing its acceptability to the consumer. Flavour compounds such as diacetyl, imparts buttery flavor toDahi,and is generated by some bacteria viz. Leuconostoc(Vinderolaet al., 2002). Dahi produced on domestic levels has undefined cultures, thus, difference in texture and taste is often observed. With standardization of culture and production conditions a defined product of consistent quality (sensory and textural) can be achieved. ProbioticDahihas also been manufactured by including secondary organism like Streptococcus thermophilus and Lactobacillus acidophilus. It is also influenced by the quality of milk, temperature, time and storage conditions(Garg and Jain, 1980; Cogginset al., 2010). The Prevention of Food Adultration (PFA) Act definesDahias ‘a semi solid product’, obtained from pasteurized or boiled milk by souring using harmless lactic acid or other bacterial cultures.Dahimay contain additional cane sugar. It should have the same minimum percentage of fat and solid-not-fat (SNF) as the milk from which it has been prepared (De, 1980; Kumar and Mishra,2004). The Bureau of Indian standards (BIS) specification for fermented milk products are based on the types of culture used in their preparation (Anon, 1990). MildDahiis made from mesophiliclactococci. Leuconostoc may be used to adjust the flavor to the buttery flavor. SourDahicontains additional cultures from thermophillic group of bacteria. For manufacturing of Dahi different kinds of milk (i.e. cow, buffalo, goat) can be used. The composition of milk used to produce cultured dairy products is given in Table 1. Dahi made from buffalo milk is thick in consistency due to high content of SNF in the buffalo milk. In traditional method ofDahimanufacturing, milk is first boiled in open kettle prior to fermentation that results in evaporation of moisture from milk making it more concentrated. In most of the cases increase in 10-15 percent in solids is observed, leading to thick body and desirable texture. It is recommended to makeDahifrom a mixture containing 11-13 percent SNF. SNF of milk could be increased by addition of skim milk powder (SMP) or condensed skim milk. This resulting increase in protein content keeps the product from wheying off and provides a custard-like consistency (De, 1980). Fat content inDahi can be standardized as per demand of the consumer ranging from full fat to no fat. Post fermentation heat treatment toDahi can be helpful in extension of shelf life of the product but it destroys the bacterial cultures thus reduces the health beneficial properties. Thus, the codex mandates differentiate the labeling standards by live microorganisms and the heat treated products. Such products should be labeled such as “contains no active culture” for the consumer to make informed choice. Milk is the natural habitat of numerous lactic acid bacteria causing the natural souring of milk, held at bacterial growth temperature and appropriate length of time. Lactic acid bacteria can enter the milk from various sources such as air, utensils, milking equipment, milchers, cow feed etc. The soured milk gets undesirable texture and flavor, reducing its acceptability and contamination of the product from extrinsic factors can cause serious health hazards. However during the commercialization, starters containing specific genes, species and strains of cultures are used to generate desired flavor, body and texture characteristics (Chandan and Shahani, 1995). For commercial success of Dahi, the culture should meet the rapid acid development, typicalDahiflavor, body and texture, exopolysachharide secreting strains to enhance viscosity of the product, scale up possibilities in various production conditions, including compatibility with variety and levels of ingredients used, fermentation time and temperatures, survival of culture viability during shelf life of Dahi, possessing desirable health and probiotic properties and exhibiting survival in the human gastrointestinal tract for certain health attributes, minimum acid production during distribution and storage at 5oC-10oC untilDahiis consumed. 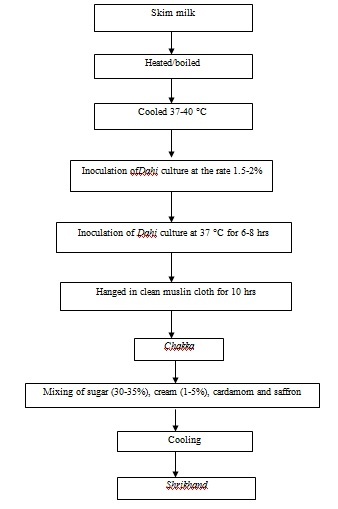 Table 3 shows the characteristics of mesophilic cultures used in manufacturing of Dahi. Microbiological specifications of these cultures suggests that counts of mesophilic lactic, yeast and moulds, coliform, anaerobic spore formers and salt tolerant micrococci should not exceed 10 cfu/g. E. coli, S. faecium and coagulase positive staphylococci should be less than 1 cfu/g. Culture should be free from pathogenic microorganism. Dahiis made from fat standardized milk. All ingredients should be of high quality and should be maintained the quality standard. While manufacturingDahi at commercial level it is necessary to standardize and control the day to day product to meet consumer expectations and regulatory obligations. Since the total solids in cows and buffaloes milk ranges from 11 to 17 percent, therefore the cultured products from these milks vary in consistency from fluid to custard like. Casein also plays an important role in determining the texture ofDahi, casein coagulates on souring at isoelectric pH 4.6. The whey proteins are considerably denatured by heat treatment prior to culturingand as the denatured whey protein reacts with kappa casein (k-casein) as well as with other whey proteins, this ensures a better network formation and a firmer gel. A cultured milk plant should be specially designed to minimize the contamination of product with pathogenic micro-organisms. Even air is filtered in this regard. This type of plant has separate receiving section to receive, weigh and store the raw material. The culture room with control laboratory is completely separated from the processing section. In addition a dry storage area, a refrigerated storage area, a mix processing room, a fermentation room and a packaging room are maintained in the plant. A mix processing room containing equipments for standardization, milk separation, pasteurizing, incubation, heating and homogenization along with necessary pipelines, fittings, valves and controls is established (Bhattacharya et al., 1972; De and De, 1999; Soukoiliset al., 2007). Milk is generally stored in silos. The inner layers of silos are made up of good quality of stainless steel (Grade AISI 304) to avoid corrosion. The stainless steel is then covered with 125 mm of insulated materials which in turn is surrounded by outer shell of stainless steel or aluminum. In processing ofDahiand other fermented products the mixture is heat treated more severely (between 80 to 85oC) than the conventional pasteurization methods. There are many beneficial effects of these heat treatments such as: (a) development of sterile medium that inhibit the growth of any undesirable microorganism; (b) removal of air from the medium to produce a more conductive medium for the growth of microaerophilic lactic cultures; (c) effecting thermal breakdown of milk constituents especially proteins that release peptones and sulfhydryl groups which provide nutrition and anaerobic conditions of the starter culture (d) it denatures and coagulate the milk protein which enhance the viscosity of the product (Bhattacharya et al., 1972). The homogenizer is a high pressure pump forcing the mix through extremely small orifice. Homogenization is generally conducted by applying pressure in two stages. The pressure in the first stage is of approximately 210 kg/cm2that reduce the averageparticle size of fat to approximately 4 microns of diameter. The second stage uses 35 kg/cm2 pressure, used to break the clusters of fat globules separately. After homogenization all the fat globules of the milk has an average size below 1 micron. Homogenization of milk reduces the surface creaming in Dahiand ensures a better texture due to the fact that the increase in total surface area of the fat globules resulting from homogenization results in milk proteins (primarily casein) absorbing onto the surface of the fat globules. The homogenized fat globules thus act as active components of the protein network in the final Dahi(Bhattacharya et al., 1972; Wu et al., 2000). Fermentation starts with the addition of culture in the milk. Addition of culture is done after cooling the milk to 37oC. The inoculated milk is then packaged in separate cups with lids. After that cups are arranged in crates which are then transferred to hot room (37˚C) while the fermentation process proceeds. The pH of the milk in the cups should be regularly checked and when it reaches 4.4-4.5, these crates are transferred to room with temperature 3-4oC for proper setting. 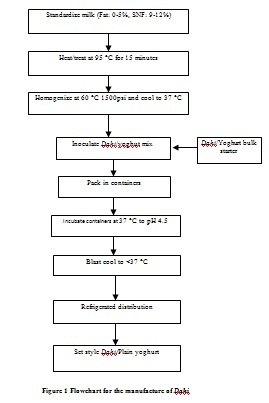 Figure 1Shows the process flowchart for manufacture of Dahi. Dahi normally contains no added sugar or flavor. Consumers can add sugar and flavor inDahiaccording to their choice.Dahican also be used for dressing of salads of fresh fruits and grated vegetables (De, 1980; Rautray and Mishra, 2011). Dahiis generally packaged in polyethylene, polypropylene, polystyrene packaging material and plastic cups (Saint-Eve et al., 2008) and it is recommended to store the packagedDahiin between 1-4oC to extend the shelf life. At 7oC the shelf life ofDahiis estimated to be two to three weeks. To make a product with themost desirable attributes the standards of fats, solids, viscosity, pH and organoleptic characteristics should be strictly followed. In the case ofDahi yeast is more potent contaminant than moulds or bacteria. Yeast and mould contamination may arise by contaminated starter cultures, packaging materials, and equipments. This could be avoided by following good sanitation processes. Organoleptic examination and microscopic examination of the starter could be helpful in eliminating the fungal contamination. Contaminated cultures should be avoided for product manufacturing. Lactic acid and some other metabolic products that are formed due to fermentation process inhibit the growth of most of the gram negative psychotropic bacteria (Anon, 1990). MishtiDoi is also called as payodhi or lalDahiand is a popular product in the eastern parts of India, mostly West Bengal, where it is served with meal as a dessert.MishtiDoi is consumed on festive occasions and is considered auspicious item to serve while starting for journey or any important work. It is generally packaged in earthen pots (Tomasik, 1993; Tamang, 2016). Traditionally, MishtiDoi is prepared from thickened milk with addition of palm jaggery, cane jaggery or sugar and then allowed to set by adding culture as in the case of Dahi. Cane sugar is the most common sweetener used in MishtiDoi. The process is usually carried out in earthen pot which finally imparts a characteristic earthy flavor to the product and also absorbs the extra whey. It is served chilled (Ghosh and Rajorhia, 1990). MishtiDoi is a fermented milk product with yellowish or creamishcolor with firm consistency, smooth texture and pleasant aroma (Raju and Pal, 2009). There were no available PFA standards forMishtiDoi. There are different grades of MishtiDoi available in the market such as low fat, medium fat and high fat. Majority of theMishtiDoi prepared is produced on cottage scale. Due to lack of mechanization and standardization in the composition and quality of the raw materials and manufacturing techniques the market quality of the product varies considerably. However, attempts made to commercialize this product have met with little success (Goel, 1998; Raju and Pal, 2009). A technology has been developed for manufacturing of MishtiDoi by the organized sectors. A wide range of sources (Table 4) of milk solids can be used in production of MishtiDoi. By combining all the ingredients in proper amount a well set MishtiDoi can be manufactured keeping in view the final composition and texture of the final product. Fresh, wholesome and good microbial and sensory quality ingredients are used, as the quality of raw material directly influences the quality of the final product. The acidity of MishtiDoi should not exceed 0.16%LA. The pH should be in the range of 5.2-5.4. It should be clot on boiling negative and free from off flavors (Goel, 1998). Selection of starter culture is the most critical step in manufacturing of the product since it is responsible for flavor and texture development. Mixed culturesre generally used since it gives superior quality of product and performs more reliably under variable conditions. Optimum performance of theMishtiDoiculture is expected to be at 42oC. A good culture develops at 0.7 percent acidity within 6-8 hours with 1 percent inoculums (Chandan, 1982; Mandal, 2014). MishtiDoi is colored and flavored with caramel. Caramel is produced by heating the sugar or also available commercially in viscous form. The pH of the caramel should be equal to the pH of the product that is around 5.0. Other ingredients like vanilla, cardamom and rose is used with or without nuts to make a wide range of MishtiDoi (Goel, 1998). Milk fat is the most important constituent of MishtiDoi (Table 5). It gives a characteristic top layer and a creamy rich flavor. SNF is responsible for giving smooth texture to the product (Ghosh and Rajorhia, 1990). For industrial production of MishtiDoi milk and cream is heated in a vat with addition of SMP to increase the total solid. Sugar is also dry blended at this stage. Caramel is added at the rate 0.1 to 0.12 percent before heating of the mix. The mix is heated to 80-90oC in a vat. It is necessary to have a filter in the process line to filter all suspended matters and the lumps. It has been observed that heating the mixture at 85oC for 15 minutes gives the product better characteristics. After that the mix is cooled to 40-45oC in plate heat exchanger or circulating cold water around the vat (Ghosh and Rajorhia, 1990). The culture is added with constant stirring at the rate 1 percent of the mixture. Inoculation is done at 43oC so that it could be transferred to earthen cups easily. Lids are used onto the cups to make the cups airtight and prevent leakage of the product. Then the cups are arranged in crates in such a way that it causes minimum shaking and enough space is provided in between each cups and crates so that air could pass through them. The mixture is then incubated at 42 ± 1oCfor about 6-8 hours till the acidity develops to about 0.7 to 0.8 percent of lactic acid (Chandan, 1982; Mandal, 2014). Product is stored for incubation. The crates or trolleys used for arranging the cups are left undisturbed in the incubation room to prevent mechanical damage. Once the desired level of texture and acidity is obtained the product is shifted to cold store room of about 4oC with minimum disturbance. The products at this stage are weak in body and texture. The storage temperature should be in between 3-5oC if the product is required to be stored for longer period of time. But there may be problem of freezing at this temperature and cause hardness of the product and make the product more floppy. Thus special care should be taken during storage of the MishtiDoi to prevent freezing (Ghosh and Rajorhia, 1990). MishtiDoi is arranged in crates and is transported in insulated box with cooling pads inside to maintain the temperature. The shelf life of MishtiDoi will be stored at 10oC is 3 days, 5days at 4oC. Several types of MishtiDoi are available such as with added flavors (cardamom, vanilla, and butter scotch), fruits (mango, bananas, cherry) or grains and nuts (almond and pistachio).MishtiDoimanufactured without cream layer on the top reduces the tendency of wheying off and also gives the product smooth body texture. The effect of different bulking agents viz. maltodextrin, sorbitol and polydextrose, on the physico-chemical, sensory and textural properties of artificially sweetened mishtiDahi with aspartame and acesulfame K was studied by (Raju and Pal, 2011). Standard method with slight modification was followed for manufacturing MishtiDoi. It was found that maltodextrin is the best bulking agent as compared to others. Maltodextrin increases the acidity, water activity, viscosity, hardness, adhesiveness and gumminess of the mishtiDahi. Shrikhand is a semi soft, sweetish sour, whole milk product prepared from fermented curd (Kulkarniet al., 2006).The curd (Dahi) is partially strained through a cloth to remove the whey to produce a solid mass called Chakka(the basic ingredient for Shrikhand). Chakkais mixed with the required amount of sugar to yield Shrikhand(Anejaet al.,1977). The product thus obtained is garnished with nuts and condiments.Shrikhandis a very popular product and forms the part of meal on special and festive occasions particularly in the states of Gujarat and Maharashtra (Jain et al.,1998). Like Dahi, it is also very refreshing product particularly in summer seasons. Addition of artificial coloring or flavoring substances in Shrikhand is discouraged (Patel and Chakraborty, 1988). According to PFA,Shrikhandis the product obtained from whole or skimmed milkChakkato which milk fat is added (Upadhyay and Dave, 1977). It may contain fruit, nuts, sugar, cardamom, saffron and other condiments. It shall not contain any added coloring and artificial flavoring substances. It shall confirm to the specifications given in table 6.The specified standards of Bureau of Indian Standards (BIS) for Shrikhand, under the Prevention of Food Adulteration (PFA) and under Food Safety and Standards Authority of India (FSSAI) are given in Table 6. The manufacturing ofShrikhandconsists of preparation of curd by adding starter culture to milk, preparation of Chhaka by draining the whey and mixing of additional ingredients such as sugar and condiments to obtain desired product. Traditionallycow or buffalo milk is heated to near boiling temperature and then cooled to 30-35oC. It is then inoculated with lactic acid bacteria culture at the rate 0.5 to 1 percent of milk. Milk is then left at room temperature (30-35oC) for 5-7 hours for setting of curd (Patel andChakraborty, 1985a). WhenDahiis firmly set, it is hung in muslin cloth overnight for drainage of whey. After 10-12 hours Chakka is obtained. It has been observed that there is 65 percent recovery of Chakkafrom milk depending on the composition of milk (Patel and Chakraborty, 1985b). Then the Chakkais mixed with required amount of sugar (usually 50-100 percent of Chakkaweight), condiments and other herbs. Commonly used spices or condiments are cardamom, saffron, cream, Charoli, (Buchananialanzan is a tree which produces the seeds known as Charoli also called Chironji. These seeds are used as a cooking spice primarily in India. Charoli are tiny almond-flavoured dried seeds of a bush. After the hard shell is cracked, the stubby seed within is as soft as a pine nut, almonds, nutmeg, cashew nut, mango pulp, raisins and seasonal fruits (Bhattacharya et al.,1971). About 1.5-2 kg ofShrikhandis obtained from 1 kg of Chakka(Sharma, 1998).Shrikhandis served chilled. The flowchart for manufacture of shirkhand is shown in Figure 2. In Gujarat, people prefer sweetened Shrikhandwhile in Maharashtra, salty or sourShrikhand is preferred (Jain et al., 1998). Chakka is manufactured by draining the whey from curd. Drainage of whey from curd is done mechanically, using either a basket centrifuge at 1100 rpm or a quarg separator. To mix the ingredients, planetary mixers of capacity of only 40 kg/batch were earlier used. However, now scraped surface heat exchangers are preferred over traditional mixers since this have the capacity of mixing of more than 500 kg per minute. These types of mixers in combination of two or three can be used in acontinuous production system (Aneja and Vyas, 1983a). Shrikhandis prepared by adding sugar and other desired ingredients with Chakka(Aneja and Vyas, 1983b). Sugar is added at the rate 50-100% of Chakkaweight and mixed in scraped surface heat exchanger (SSHE). Some amount of cream is also added to attain the final fat in the product to 8.5% on dry matter basis (Patel, 1997). The titratable acidity should be in the range of 1.10 to 1.40% LA. Herbal Shrikhand has been manufactured by adding water extract of Brahmi and Ashwagandha(Brahmi and Ashwagandha are Indian origin herbs that have large amount of antioxidant and polyphenolic components. Brahmi have memory enhancing properties while Ashwagandha have immunomodulatory, anticancerous and health promoting benefits) in Chakka with other ingredients that posses many antioxidant properties and different medicinal properties such as immunostimulatory, memory enhancing and anti hypertensive properties (Prasad, 2011). Guava pulp enriched Shrikhand has been manufactured by Kumar (2011), to increase the amount of vitamin C in the Shrikhand. This product has been found to be organoleptically acceptable. The product was slightly creamy in color than the conventional Shrikhand. For packaging ofShrikhandgenerally preformed polystyrene cups are used (Patel and Chakraborty, 1985b). The shelf life ofShrikhanddepends on the temperature and initial microbial load of the raw materials (Sharma and Zariwala, 1980). At ambient temperature i.e. at 30oC it gets spoiled within 2-3 days. But under refrigerated condition (4oC) it may be kept for 40 days.Shrikhandis stored at -18 to -20oC that enhances the shelf life of the product for six months (Aneja and Vyas, 1987). For preparation of Chakkapowder (Figure 3), whey is first of all removed fromDahiand thenDahiis ground in a colloid mill to obtain slurry with smooth and uniform consistency. The slurry is then heated to 38oC followed by homogenization at a pressure of 100 kg/cm2. Finally, the slurry is passed through a spray drier with inlet temperature 185oC and outlet temperature 85oC to obtain Chakkapowder (De and Patel, 1989). Chakka taken from wholemilk is considered as the superior powder according to its consistency and aroma for incorporation in Shrikhand. The proximate composition of Chakka and Shrikhand powder is given in Table 5. Lassiis the local name of buttermilk.Lassi also called stirredDahi,is a refreshing summer beverage, mainly popular in north India. Lassi is white to creamy white in color, liquid viscous, with sweet taste, rich aroma to and slightly acidic. Depending upon the consumer preferenceLassican be either flavored with salt or sugar and other condiments or spices.Lassiis manufactured using pasteurized milk cultured with flavor producing culture microorganisms (Anejaet al.,1989). The phospholipids rich fraction obtained as by-product during churning ofDahiwhile making of makkhan (fresh butter), may also be termed as Lassi.Lassiis originally a product of rural India and was earlier was only produced at cottage scale. However, commercial production of this product is now established. SaltedLassiis marketed in many parts of the country. Commercially availableLassican be aseptically packaged in milk cartons/sachets/UHT cartons (Ramana, 1994; Antuneset al., 2007). Newer technologies have been incorporated in the manufacturing of Lassi. Pasteurization, homogenization and culturing system are the steps that are taken into the manufacturing processes (Tiwari, 1998). TraditionallyLassiwas manufactured by stirringDahiwith small amount of water. Other additives inLassi are dependent on the local areas and individual preferences. In northern part of IndiaLassiis mixed with sugar while in southern part of the country salt along with other condiments such as crushed ginger, green chillies and curry leaves can be admixed in Lassi. In the southern states of IndiaLassiis preferred less viscous as compared to northern parts and have a pleasant aroma. CommerciallyLassiis prepared by churningDahimechanically and then adding sugar in the form of syrup. Syrup is added to improve the thickening of theLassiand also eliminate the addition of water. To improve the texture, homogenization is applied. Lassi can be flavored with rose or Kewara(It is a shrub with fragrant flowers. They are used to extract perfume, aromatic oil (Kewara oil) and fragrant distillations. These are stimulant and antispasmodic and are used against headache and rheumatism. The flowers are also used to flavour food; Kewara essence is used in numerous Indian sweets like rasogolla, petha (candied gourd or winter squash), rasmalai and burfi, (especially in Rajasthan). Essence and then packaged in bottles or pouches and stored at refrigerated temperature. 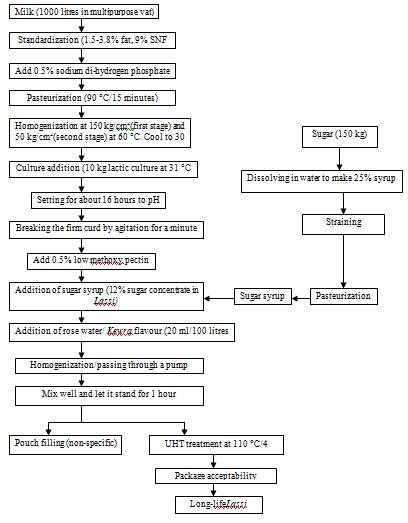 The process flowchart for manufacturing of Lassi is shown in Figure 4. Under refrigerated condition the shelf life of Lassican be enhanced. Further extension can be achieved by UHT processing after fermentation and aseptic packaging (Ramana, 1994). Industrial production ofLassihad made significant advancements through application of UHT processing. Standardized milk (9-10% SNF, 0.5-1.0% milk fat) is heated at 85oC for 30 minutes or 91 oC for 2.5-5 minutes and then suitable lactic acid culture is inoculated at 31oC (Chandan and Shahani, 1995). It is then allowed to ferment by keeping the milk at 22oC till its pH reduces to 4.5. Then the set curd is stirred broken with mechanical stirrer along with mixing of sugar syrup (30%). This gives 8-12% sugar concentration in the blend. For proper textureLassiis homogenized at 13.7 Kpa and UHT processed at 135-145oC for 1-5 seconds and then packaged aseptically employing suitable equipments (Ladkaniet al., 1993). The defects in the quality ofLassiare very much similar to that of Dahi. The approximate composition of Lassi is given in Table 5. Matha or Chhach are the synonyms of buttermilk, which is consumed in all parts of the country. It is a consumed as refreshing summer beverage. Mattha or Chhach is a byproduct obtained during manufacturing of Makkhan fromDahiduring its churning.It is famous for its aroma and mildy sour taste which is developed during fermentation by mixed microflora preferably lactic acid bacteria (Anantakrishnan and Srinivasan,1964). The curd is churned into thick buttermilk which is called Moru in Kerala. Moru is diluted with water to reduce the acidity and then flavored with salt. When crushed ginger, green chillies and curry leaves are sometimes added to buttermilk, called Sambharaam which is popular in southern part of the country (Achaya, 1998). Initially, milk is boiled and then cooled to 37oC and then inoculum is added at the rate 1.0-1.5% of the milk. It is then allowed to set for overnight at 22oC.When milk is set, small amount of water is added and is stirred with small wooden stirrer with wooden impellers locally called “Mathani” driven circularly by a rope in ‘to and fro’ motion. The Makkhan thus obtained is collected as a result of regular beating at the top layer which is removed from time to time. When all the Makkhanis removed from the mixture, the residue could be consumed asMatthaor Chhach(Anantakrishnan and Srinivasan, 1964). Mattha is a liquid product that is highly flavorful and highly acidic. It contains 6-7% milk solids and 1-2% fat.Matthais also rich in protein and lactose. The quality defects of Mattha are very similar to Dahi and Lassi(Achaya, 1998). Fermented dairy products have a special place in Indian diet. No meal in India is complete without a bowl of Dahi. Products such as Dahi, Lassi, Shrikhand, Chhach are consumed throughout the country on regular basis. Not much information of the quantity of production of these indigenous fermented products is available as these are produced in highly unorganized manner. Mechanized production of these products has been recently attempted and is successful to some extent. However, far most these products are still manufactured on household or cottage scale. It is necessary to utilize the surplus milk produce of India in a sensible manner and converting it into its fermented products is a possible solution. Gadaga, T.H., Mutukumira, A.N., Narvhus, J.A., Feresu, S.B. : A review of traditional fermented foods and beverages of Zimbabwe. International Journal of Food Microbiology, 1999; 53(1): 1-11. Kabak, B., Dobson, A.D.: An introduction to the traditional fermented foods and beverages of Turkey. Critical Reviews in Food Science and Nutrition, 2011; 51(3): 248-260. Wouters, J.T., Ayad, E.H., Hugenholtz, J., Smit, G.: Microbes from raw milk for fermented dairy products. International Dairy Journal, 2002; 12(2): 91-109. Nair, B.M., Prajapati, J.B.: The history of fermented foods. In Handbook of Fermented Functional Foods. CRC Press, 2003; pp. 1-25. Shiby, V.K., Mishra, H.N. : Fermented milks and milk products as functional foods-A review. Critical Reviews in Food Science and Nutrition, 2013; 53(5): 482-496. Cross M L, Stevenson, L., Gill, H.S. : Anti-allergy properties of fermented foods: an important immunoregulatory mechanism of lactic acid bacteria? International Immunopharmacology, 2001; 1(5): 891-901. 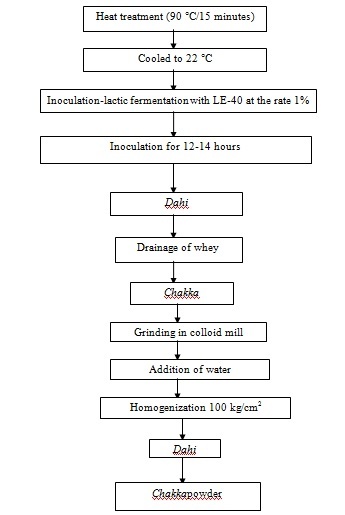 Dewan, S., Tamang, J.P.: Dominant lactic acid bacteria and their technological properties isolated from the Himalayan ethnic fermented milk products. Antonie van Leeuwenhoek 2007; 92(3): 343-352. Yadav, H., Jain, S., Sinha, P.R. : Antidiabetic effect of probiotic dahi containing Lactobacillus acidophilus and Lactobacillus casei in high fructose fed rats. Nutrition, 2007; 23(1): 62-68. Harun-ur-Rashid, M., Togo, K., Ueda, M., Miyamoto, T.: Identification and characterization of dominant lactic acid bacteria isolated from traditional fermented milk Dahi in Bangladesh. World Journal of Microbiology and Biotechnology 2007; 23(1): 125-133. Sodini, I., Lucas, A., Oliveira, M.N., Remeuf, F., Corrieu, G.: Effect of milk base and starter culture on acidification, texture, and probiotic cell counts in fermented milk processing. Journal of Dairy Science, 2002; 85(10): 2479-2488. Nahar, A., Al-amin, M, Alam, S M K, Wedud and Islam M N (2007) A comparative study on the quality of dahi (yoghurt) prepared from cow, goat and buffalo milk. International Journal of Dairy Science, 2007; 2(3): 260-267. Nielsen, M.S., Martinussen, T., Flambard, B., Sørensen, K.I., Otte, J.: Peptide profiles and angiotensin-I-converting enzyme inhibitory activity of fermented milk products: effect of bacterial strain, fermentation pH, and storage time. International Dairy Journal, 2009; 19(3): 155-165. Vinderola, C.G., Mocchiutti, P., Reinheimer, J.A. : Interactions among lactic acid starter and probiotic bacteria used for fermented dairy products. Journal of Dairy Science, 2002; 85(4): 721-729. Garg, A.R., Jain, S.C.: Studies on the textural characterstics of curd. I. Effect of time-temperature combination for pasteurization and fat and protein content of milk. Milchwissen 1980; 35(4): 738-742. Coggins, P.C., Rowe, D.E., Wilson, J.C., Kumari, S. Storage and temperature effects on appearance and textural characteristics of conventional milk yogurt. Journal of Sensory Studies, 2010;25(4): 549-576. De, S. Outlines of dairy technology: dahi. Oxford University press, New Delhi. 1980; pp. 404-410. Kumar, P., Mishra, H.N. : Yoghurt powder—A review of process technology, storage and utilization. Food and Bioproducts Processing, 2004; 82(2): 133-142.
: Technology of traditional milk products in developing countries: dahi. FAO Animal Production and Health Paper 85, FAO/WHO, Rome, Italy. 1990; pp. 250-252. Chandan, R.C., Shahani, K.M. : Cultured milk products in CRC handbook of processing and utilization in agriculture, Animal products. I. Wolf (Ed). CRC Press. Boca Raton, FL. 1982; pp. 365-377. Bhattacharya, D.C., Mathur, O.N., Tiwari, B.D., Balachandran, R., Srinivasan, M.R. : Studies on the method of production of shrikhand and shrikhand Paper presented at the VIII Dairy Industry Conference, Trivandrum, India. 1971. De Brabandere, A.G., De Baerdemaeker, J.G. : Effects of process conditions on the pH development during yogurt fermentation. Journal of Food Engineering; 1999; 41(3): 221-227. Soukoulis, C., Panagiotidis, P., Koureli, R., Tzia, C.: Industrial yogurt manufacture: monitoring of fermentation process and improvement of final product quality. Journal of Dairy Science, 2007; 90(6): 2641-2654. Bhattacharya, D.C., Tiwari, B.D., Balachandran, R., Srinivasan, M.R. : Suggestions for industrial production of dahi and fermented milk drinks. Eclat, 1972; 4(10): 6-10. Wu, H., Hulbert, G.J., Mount, J.R.: Effects of ultrasound on milk homogenization and fermentation with yogurt starter. Innovative Food Science & Emerging Technologies, 2000; 1(3): 211-218. Routray, W., Mishra, H.N. : Scientific and technical aspects of yogurt aroma and taste: a review. Comprehensive Reviews in Food Science and Food Safety, 2011; 10(4): 208-220. Saint-Eve, A., Lévy, C., Le Moigne, M., Ducruet, V., Souchon, I.: Quality changes in yogurt during storage in different packaging materials. Food Chemistry, 2008; 110(2):285-293. Tomasik, P.C. : Encyclopedia of food science, food technology and nutrition, vol.1. Ed. R. Macrae, R.K. Robinson and M.J. Sadler. Academic Press, NY, USA. 1993; pp. 655-664. Tamang, J.P. Indian dietary culture. Journal of Ethenic Foods, 2016; 3: 243-245. Ghosh, J., Rajorhia, G.S. : Technology for production of mishtidoi,A traditional fermented milk product. Indian Journal of Dairy Science, 1990; 43(2): 239-246. Raju, P.N., Pal, D.: The physico-chemical, sensory, and textural properties of MistiDahi prepared from reduced fat buffalo milk. Food and Bioprocess Technology 2009; 2(1): 101-108. Goel, B.K. : Studies on feasibility of commercial production of mishtidoi, A techno-economic aspect. Indian Dairyman, 1998; 50(3): 11-15. Chandan, R.C. : Other fermented dairy products. Chapter. 5 in Prescott and Dunn’s Industrial Microbiology. 4th G. Reed (Ed). AVI Publishers, Westport, Ct, USA. 1982; pp. 113-184. Mandal, S. Production of Direct Vat Set (DVS) MistiDahiCulture (Doctoral dissertation, NDRI, Karnal), India. 2014. Raju, N., Pal, D.: Effect of bulking agents on the quality of artificially sweetened mishtidahi (caramel colored sweetened yoghurt) prepared from reduced fat buffalo milk. LWT – Food Science and Technology 2011; 44: 1835-1843. Kulkarni, C., Belsare, N., Lele, A.: Studies on shrikhand rheology. Journal of Food Engineering, 2006; 74(2): 169-177. Aneja, R.P., Vyas, M.N., Nanda, I.L., Thareja, V.K. : Development of an industrial process for the manufacture of shrikhand. Journal of Food Science and Technology, 1977; 14: 159-163. Aneja, R.P., Vyas, M.N. : Improvements in or relating to a method of separating the solids content known as ‘maska’ or ‘chakka’ from curds. 1983a; Indian patent No. 157048. Jain, A., Desai, H.K., Upadhyay, K.G. : Chemical quality of market shrikhand sold in Gujarat market. Indian Journal of Dairy Science, 1998; 51: 423-426. Patel, R.S., Chakraborty, B.K. : Shrikhand: A review. Indian Journal of Dairy Science, 1988; 41(1): 109-115. Upadhyay, K.G., Dave, J.M. : Shrikhandand its technology. Indian Dairyman, 1977; 28(9): 487. Patel, R.S., Chakraborty, B.K. : Factors affecting the consistency and sensory properties of shrikhand. Egypt Journal of Dairy Science, 1985a; 13: 73-78. Patel, R.S., Chakraborty, B.K. : Use of different sources of milk solids for shrikhand Egypt Journal of Dairy Science, 1985b; 13: 79-84. Sharma, D.K. : Application of ultrafiltration for manufacture of chhana and shrikhand in Advances in traditional dairy products. CAS in dairy Technology. NDRI Deemed University, Karnal, 1998; pp. 97-102. Patel, R.S. : Process alterations in the manufacture of shrikhand in Advances in traditional dairy products. CAS in Dairy Technology. NDRI Deemed university, Karnal. 1997; pp. 92-96. Patel, R.S., Chakraborty, B.K. Reducing curd forming period in shrikhand manufacturing factory process. Le Lait, 1985c; 65(1): 55-64. Singh, K.V., Kumar, R., Singh, L., Bhaskar, M.L. : Effect of SNF levels of milk on the quality of shrikhand. The Journal of Rural and Agricultural Research, 2014; 14(1): 47-48. Jagannath, A., Ramesh, M.N., Varadaraj, M.C. : Predicting the behavior of Escherichia coli introduced as a postprocessing contaminant in shrikhand, a traditional sweetened lactic fermented milk product. Journal of Food Protection, 2001; 64(4): 462-469. Aneja, P., Vyas, M.N. : Improvements in or relating to a method of separating the solids content known as ‘maska’ or ‘chakka’ from curds. 1983b; Indian patent No. 157049. Prasad, M.: Process Optimization for manufacturing of herbal shrikhand by incorporating brahmiand ashwagandha M Sc Thesis, Centre of Food Science & Technology, Institute of Agricultural Sciences, Banaras Hindu University, Varanasi, Uttar Pradesh, India. 2011. Kumar, M.: Technology of manufacture of Guava shrikhand. M Sc Thesis, Centre of Food Science & Technology, Institute of Agricultural Sciences, Banaras Hindu University, Varanasi, Uttar Pradesh, India. 2011. Patel, R.S., Chakraborty, B.K. : Process alteration in shrikhand Ph.D. Thesis. Kurukshetra University, Kurukshetra, Harayana, India. 1985d. Sharma, U.P., Zariwala, I.T. : Deterioration of shrikhand during storage. Indian Journal of Dairy Science, 1980: 33(3): 223-231. Aneja, R.P., Vyas, N.: Improvements in or relating to a method of maintaining the keeping quality of shrikhand. 1987; Indian patent No. 157050. De, A.K., Patel, R.S. Technological aspects of manufacturing chakka Japanese Journal of Dairy and Food Science, 1989; 38: 169-173. Aneja, R.P., Vyas, M.N., Sharma, D., Samal, S.K. : A method for manufacturing lassi. 1989; Indian Patent no. 17374. Ramana, B.L.V. : Standardization of a method of manufacture of lassi with enhanced shelf stability. M.Sc. Thesis. 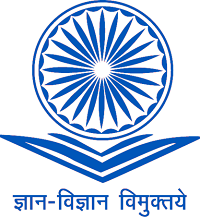 NDRI Deemed University, Karnal, India. 1994. Antunes, A.E.C., Grael, E.T., Moreno, I., Rodrigues, L.G., Dourado, F.M., Saccaro, D.M., Lerayer, L.S. : Selective enumeration and viability of Bifidobacteriumanimalis subsp. lactis in a new fermented milk product. Brazilian Journal of Microbiology,2007; 38(1): 173-177. Tiwari, B.D. : Technology of In. Advances in traditional dairy products. CAS in Dairy Technology. NDRI Deemed University, Karnal. 1998; pp. 103-106. Chandan, R.C., Shahani, K.M. : Other fermented dairy products. Chapter 10 in Biotechnology, 2nded, vol.9. G. Reed and T.W. Nagodawithania (Ed). VCH Publishers Inc. Weiheim, Germany. 1995; pp. 386-418. Ladkani, B.G., Tiwari, B.B., Kanawjia, S.K., Singh, S. Development of a process for the manufacture of lassi Annual Report, NDRI Deemed University, Karnal, Haryana, India. 1993. Anantakrishnan, C.P., Srinivasan, M.R. : Milk products of India: Buttermilk. Indian Council of Agricultural Research, New Delhi, India. 1964; pp. 54-57. Achaya, K.T. : A historical dictionary of Indian food. Oxford University Press, New Delhi, India. 1998. Longwah, T., Ananthan, R., Bhaskarachary, K., Venkaiah, K.: Indian food composition tables. National Institute of Nutrition (Indian Council of Medical Research), Hyderabad, India. 2017. Aneja, R.P., Mathur, B.N., Ed. Gupta, P.R., Chandan, R.C., Banerjee, A.K. Technology of Indian Milk Products. A Dairy India Publication, Delhi, India. 2002; pp. 158-180. Ceballos, L.S., Morales, E.R., de la Torre Adarve, G., Castro, J.D., Martínez, L.P., Sampelayo, M.R.S. : Composition of goat and cow milk produced under similar conditions and analyzed by identical methodology. Journal of Food Composition and Analysis, 2009; 22(4): 322-329. Hadjipanayiotou, M.: Composition of ewe, goat and cow milk and of colostrum of ewes and goats. Small Ruminant Research, 1995; 18(3): 255-262. Food Safety and Standards Regulations FSSAI. Food Safety and Standards Authority of India.